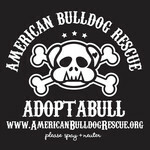 American Bulldog Rescue was contacted by Humane Rescue Alliance in Washington DC on January 4th 2017 about a cruelty case involving an American Bulldog who was found near death by their officers. He was left for dead, abandoned in a crate outside. Their medical team practically brought him back to life. His body temp was 40 degrees. He now has enough strength to stand up. They were closely monitoring him. His "stray hold" was up in 2 days and they wanted to get him immediately into rescue. They named him Sparky. His foster family brought him home after the manditory 2 day hold and he went right to the vet for some bloodwork and Vet introduction. He came in at 56 pounds and had lots of demons. Every time Sparkey was put into his huge crate he would scream and try to break out, Foster dad tried letting him out but I he was so hungry he would try to eat anything and everything. There were a few weeks of no sleep but they never gave up on him. They tried Kong Wobblers and treat balls but his anxiety was getting unbearable. Then after another visit to the Vet he was put on Prozac. Things got better but whenever he was out of his crate he would try to eat things. Especially socks. Then after they thought there was a light at the end of the tunnel, they caught Spark eating a sock but he was too fast and he took a big gulp and it was gone. TRIP TO EMERGENCY ROOM! Sparkey was there for 2 days and luckily they were able to do a scope because he probably would not have survived being opened up. They found 3 socks. (see lovely photos). The bill for the ER was $1,734. There were mutliple wellness vist, lots of weigh-ins, and then Spark started pooping blood. Another rush to the Vet $300. The doctor prescribed few pills and everything calmed down. Sparkey has gained 20+ pounds in 2 months. He has a lot more to gain. He is slowly getting over his nightmarish past. Please consider donating towards his care. We sure could use the help. For everyone who watched him during his transformation and sent him positive vibes we Thank you.